We would love to hear from you! If you have any questions or inquiries, please contact us. Does Your Salt Lake City, Utah Home Need Broken Spring Repair? 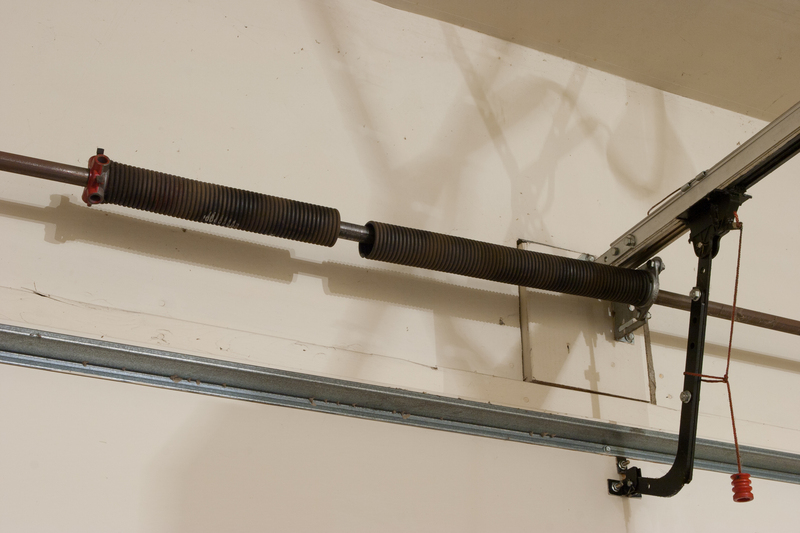 Without its trusty spring, your hefty garage door would be virtually impossible to lift. This simple mechanism, used also in catapults and fine watches, allows you (or the automatic opener) to lift your garage door with ease. It likewise holds the door up, preventing it from crashing back down on you or your car. Imagine the horrors then when the springs fail. When that happens, you will be unable to access your garage with your vehicle trapped outside or – even worse – inside. Accent Garage Doors understands the serious nature of these problems and stands ready to solve them for you when trouble strikes. Garage doors operate using a torsion or extension spring system with either a single or double spring. The coil tightens as the door opens, absorbing the weight of the door and holding it until you close it again. Sadly, most of us take these scientific marvels for granted. Springs are manufactured and rated for the number of cycles they can complete before wearing out. During each phase of a cycle (one opening and one closing), the spring winds up completely (until the door is fully open), followed by a full unwinding (when the door closes). For reliable operation, springs require a diligent schedule of regular maintenance that includes inspection, lubrication and any necessary adjustment. Without this basic level of service, the coils are bound to fail well short of their expected life span. One of the most valuable services that Accent Garage Doors provides its customers is extension and torsion spring inspection and maintenance. The first sign of spring trouble may be squeaking or excessive noise during opening or closing. When the door becomes heavy or will no longer stay open, the springs are in imminent danger of failure. Worn springs can snap violently, releasing hundreds of pounds of stored energy. The result can include major damage to door panels, your vehicle or – worse – injury to you or others. Unfortunately, if your system uses an automatic opener, you may not notice signs of trouble until it’s too late. At that point, the automatic opener may also burn out from overwork making it yet another reason why regular spring service is critical. Repair and replacement of broken springs requires the attention of trained, experienced professionals. Accent Garage Doors of Salt Lake City, Utah specializes in garage door spring repair with fully trained and experienced technicians who understand the importance of keeping springs well maintained and working properly. Accent offers rapid response times and guarantees customer satisfaction. If your garage door has begun to exhibit signs of impending spring failure, don’t take chances with your safety and security. Contact Accent Garage Doors today for a comprehensive professional inspection and broken spring repair service. Join Our Lifetime Maintenance Program! Lifetime Maintenance Includes: 24-Hour service at no extra cost, annual preventative maintenance on doors and openers, up to 20% discount on all purchases, double Warranty on all new purchases and No Annual Fees, peace of mind and convenience! © 2016 Accent Garage Doors. All Rights Reserved.